My initial plan was to review the personal -- that is free -- version of SecPod Saner here today. Everything looked promising at first. I was able to download the software to my system, the scan on Virustotal told me the application was clean, and the installation worked just fine and without any issues or third-party surprises. When I started the program however I was greeted by a screen that told me that I had to activate the software before I could use it. I could either import a license if I already had one, or request an activation key on the SecPod website. A click on the link took me there, and all looked well at first. I was asked to enter an email address and fill out a captcha to complete the registration. The issue that I ran into was that the registration did not work. It displayed the loading page status message after I typed the email address and captcha and did not change screen at all for the next couple of minutes. I tried different browsers but that did not work as well. The result? I was not able to get the activation key. Without the key, I was not able to test the software, and that is the reason why you are reading this now instead of a review of the program. I can understand that companies want information about their customers, no matter if they are not paying for the software or if they are. The problem here is that this should never get into the way of availability in my opinion. If the registration process prevents that potential customers can test the software properly, then it should be changed to mandatory instead in my opinion. The software itself looked promising and if it is good, it would have certainly got a nice boost from a positive review here on my site. But since that is not possible, I have made the decision not to test it at all. I do not want to get back to the registration form later today to find out if it is working now, or if I wasted more precious time by trying to get this damn thing to work. Now, what I would suggest instead is the following. New users should be able to run the software without activation, at least for a trial period. This ensures that potential registration issues are not blocking the user -- or in my case the reviewer -- from running the software at all. This would be the customer friendly thing to do, and since it is likely that I'm not the only user who ran into registration problems on the site, it would not have such a negative impact on potential customers and users. What's your take on forced registrations? When i see a forced registration I immediately think they’re just out to sell my email to someone else. If I really want to use it or try it, i use face or disposable addresses. If they do not accept those, I’m certain they’re want to sell my data and I won’t give them a second look. This and any other software from that developer/company get the label malware in my mind. And if anyone ask my opinion about a this or sort alike programs I give that advice to all my colleagues, family friends and guild members to avoid that company as the plague. The final straw here is that a registration process does not work when the user has already been annoyed with the surprise of having to register before even testing, getting to know the application. I agree with Martin : freeware registration is acceptable, understandable but after a trial period, or with lesser functions available until registration (not the best option IMO). But forcing to registration before anything else is rude, and even if some software companies believe that offering an application entitles them to rudeness a user may think and perceive differently. At the end it is a counter-productive attitude and, to make it short, a silly one. Does not invite the user to spread the word, not the good word anyway. SecPod Saner was its name. IMO, freeware should never ask for online registration. But if the software developer feels that he REALLY needs an email address from the customer, he should let the user try the software first and then, after 30 days (more or less), he should ask for registration. One’s email address, along with to whatever its owner must agree when giving it, has value. When software is advertised as “free,” but then requires a thing of value (in this case, in the form of one’s email address and agreement to certain terms) in exchange for the use of said software, then said software is, just categorically, not actually free. It is, in fact, a form of bait-and-switch; along with false advertising, at the very least; and is, in any case, technically illegal, at least in the United States. Few companies ever get in trouble for it, though. Sadly. But it’s nevertheless disingenuous and misleading. No one should, then, use the software from a maker which does such things; and everyone should post in as many places as possible calling people’s attention to the egregiousness, and warning them off of using the offending software. Shame on any software maker that does this despicable thing. This is a little different but still,it does relate to software said to be “Free”, One that made me cross to say the least a couple of months ago was a “Wise” Folder hider. It too is offered as FREE and it did not need me to register it either,i used it i like it, it worked quite well until i forgot my password,No worries though because it has a FORGOT YOUR PASSWORD button to click.so i clicked it, That was when i discovered the program is only free until you forget your password then they want an arm and a leg to give you a code or number or whatever to open your hidden folder,i don’t know i did not follow it through.as it happens i am just a lazy person and it was a case of not forgetting the password but forgetting what one of the few i use i had used in this case,so a few tries later and the hidden folder reappeared.Needless to say ALL “Wise” software has been removed from my PC now just in case there is any other hidden ways of getting money from unsuspecting users. There was nothing to say this would happen and as far as i know it is still the same.I sent them an E-Mail to tell them what i though & got no reply. But to me that is just wrong.I would like to think they have changed it but i will never use their software again to try and find out. i usually just stop the install if i just want to see how something works and i need to register. although i do have a junk email address just for these occasions, i’m particular about what i do with it and who gets it. I agree with all this — and wanted to add a little as well. One of the things we put in place at DonationCoder.com many years ago was trying to encourage people to sign up at our forum (which requires a valid email address), in order to get a lifetime license for our free software. Now our software could always be run without the license, and you can always download a shorter license without signing up, so it’s not the same as this — you don’t have to register in order to try or even use the software. But, we definitely have a system that strongly encourages users to sign up to get a lifetime license key. Now the thing is, we started doing this because our hope was to get more people involved in our discussion forum, and maybe encourage them to sign up to receive our newsletter. But these days, with all the data mining and aggressive spamming and collecting of data, people are right to be paranoid about giving out their email address to anyone, and I can definitely see people treating ANY site that wants their email as suspicious — hell I know I do! It makes me think about changing our approach to getting people to sign up. I think the issue in your case is that users come to your site for the software, mostly. They download it and it works. Unless they run into issues, it is unlikely that a large portion will come back. I have no idea how to change that, but the community that is behind all those great applications needs to be moved more into focus to change that. Well, that is my opinion. How nice that the person who would at least appear to be either a or the shaker and mover at DonationCoder dropped-by; and that I now have an opportunity to say something to you that I’ve always wanted to say, regarding the very thing that you’ve brought-up. Believe it or not, the very thing you’ve brought up is something about which I’ve, over the years, given no small amount of thought; and about which I’ve even written in forums and/or in comments beneath articles, etc. Sadly, most of what I’ve thought and written about it has been, I’m sorry, critical. But here’s the thing: I love your site. No, seriously… I just LOVE it. Always have. I remember it from its beginnings. I don’t participate much, though (I think my most recent posting was in Stoic Joker’s T-Clock thread; and that was the first one for a really long time); and don’t really even visit the site that much anymore. And so here’s the other thing: The reason for both things that I just wrote in the immediately-previous paragraph, despite what I wrote in the one before it, is 100% the construct that you have; especially the whole business of getting the software to work for a while, then having to do something else to KEEP it working… ohmygod, the expletives that I had for whomever thought that up. …but, rather, simply because it both asked too much of someone expecting to find the promised freeware, and it was just too-convoluted a model. I found it so off-putting that even if things have since changed, I’ve now got it in my head that I should go elsewhere for whatever I need. I’m sorry, but that’s the taste it all left in my mouth long ago, and it’s obviously still strongly there because when when I read your posting, here, I felt as kneejerk motivated to reply as I’ve ever felt about anything. And I think that part of the reason is that I’ve always felt it was so sad that you went with the model when pretty much everything else about your site is just so good and wonderful. I’ve even recommended your site to others, but not without ensure that their eyes were wide open about the model and how vexing it might be. I’m sorry, but that’s just how it all shook-out for me. …like pretty much every place else that offers freeware. All that said, please — and I mean this — keep-up the good work! And thanks for letting me vent. Hi gregg — thanks for the comments — to be honest it’s comments like this, from people who have obviously thought about the issues and WANT to like the site, that have the biggest impact on my thinking about this stuff.. I hope you’ll keep your eye on the site — I hope that in 2014 we will actually try some real simplifications that get rid of the unusual and annoying signup for free license key stuff. Just a matter of figuring out the best way to do so. Good for you Mr. Martin! I WILL NOT install a free program that makes me activate and registry before I have a change to use it. I will even block the site and make a point to never try any program that they have otherwise. I could use a false email, but why give them even this chance? Yep….this kind of sets me afire! My favorite antivirus, A…t!, will let you try it for 30 days before it requires you to activate and registry. Then you have to registry once a year. I am OK with this because I had a chance to try it out first. Thank you for standing up for this abuse. This kind of reporting makes you very special! Very interesting comments, both IMO pertinent and conducted by an honest state of mind. I just wish to share this related thought, which intervenes in my choices quite often, and not only within the matter of this article. In today’s life there seems to be more than ever — or more focused — a debate between idealism and intelligence. Are they always in correspondence ? If I refuse, be it a freeware as here mentioned that requires pre-registration, and that I find out later (an article, a friend’s experience) that this refusal has led me to miss an excellent opportunity, will have I been intelligent in my refusal ? To what extent must idealism be active ? I’m quite interested as many as what I call “Google ethics”, I mean as such an approach of life which is a balance between opportunity, pragmatism and ethics, IMO of course. Is the best option not that of a compromise between being faithful to our individual values (often shared, leading to a consensus as here on this topic) but not to the point of banishing for this purpose an opportunity which may, or not, be i.e. an excellent application/freeware ? For me personally, it depends on what the software has to offer. If it is a one of a kind software, I may go through hopes and register it. If there are alternatives, I won’t. If I do not know in advance, I won’t register. If I miss out on something, so be it. Right. Perhaps can it be a circumstantial choice, a somewhat irrational pondered one. This attitude is mine in a somewhat flew-logic approach. After all the “feeling” is data, sort of hidden data that statistically is perhaps not less invaluable than a sum of rational data when the latter is always incomplete … but still I know situations where I have missed opportunities, not those which imply a renunciation but those who where missed because of a wrong, therefore misleading “feeling”. IMO, this statement gainsays your original, categorical premise by stating that, if YOU perceive enough value in the proffered item, then you will overcome your own objections and “suffer” the developer/company’s nefarious intrusions into your, what, … privacy? In other words, when it suits you, you will make a reasonable compromise but you object to a developer asking for the same. What really is the difference between your taking that position and the developer taking the identical position that, if you find their item of sufficient interest, then you will register it; and, if you do not, then you won’t? Frankly, especially given the many real-world options to provide throw-away credentials, I find this whole controversy a tempest in teacup. If I want to grant anyone, including software developers, meaningful access to me, I provide “real” email addresses that I check regularly ; otherwise I provide one of several that I use specifically for marginal contacts. Likewise, my business card does not include my home number and my Calling Card does not include my Family Only phone number. Personally, even when I am offered something that truly is free, as when I grab one of mouser’s apps at DonationCoder.com or when I avail myself of the excellent reviews/articles/discussions here, I feel compelled to say a meaningful “Thank You”. The fact that a developer values his/her work and asks upfront for a meaningful acknowledgement of that value with something as relatively valueless as a name/email address is not something that offends my sensibilities. It’s simply not possible to avoid all places where you need to sign up and provide an email. Thankfully, as has been mentioned earlier, the solution is really pretty easy and painless, which is that all of us should have at least one junk email account (gmail, hotmail, etc.) that we use for any occasion where we have to provide an email address to some company or service. Now the only thing we need to do is remember that when we teach our parents not to download and run random stuff they find on the internet, is to teach them not to use their (or our!) real email addresses when they sign up for things. Always have a secondary email address that you only use for these kinds of things. Actually, you are talking about two things here – registration and online activation. I don’t have that much of a problem with registration, but online activation really tees me off… even for commercial application software. I paid a lot of money for FrameMaker v6; it has a serial number on the CD – makes it easy to install after upgrading to a new PC. FM v7 required online activation, so I said no. Granted, Adobe is going to be around for a while longer so if I have internet access I can get through to them – until they decide “no more activation of such _old_ software, you need to upgrade”. When it comes to freeware, why do I even need a code to activate it, let alone go online to get the code? If I like the software and and it useful, I’ll give you a real email address that I check so I can keep up-to-date on it, maybe even send some $ if I find it really useful. But online activation? That’s for demos, not freeware… My Windows 7 system is running programs from the early 1990s; the companies are long gone (so online activation would not work anymore), but their names live on. * Downloaded program and installed. Had to activate as you said. It froze the Chrome tab and I had to use Internet Explorer instead. * Didn’t accept my personal email. Had to use a gmail account. * Had to check the email. Click the URL. Then click the download. Download expired? Had to do the process all over again. * Finally got assertion.key downloaded and imported it to the program. * Ran the program and looked through all the settings. Decided to give the windows suggestions a try, as well as a couple of programs. * Rebooted. Pretty quickly realized it messed up my network shares. I would delete something and it wouldn’t delete. VLC wouldn’t run. Deleting and recreating the mapped share didn’t resolve it. Using a network path directly did not remedy it either. Decided to give up for the night. * Still having network share issues. So I decided to revert the changes within SecPod. License expired? So I tried to import the assertion.key again. Invalid. Had to go through the whole process of re-acquiring the key again. * Opened up SecPod and guess what? This program has absolutely NO backup/recover option. It also does not have a log I could view of the changes that were made. I mistakenly assumed something like that was there when making the changes. I neglected to make a System Restore point beforehand.. so I went back about a week in a system restore. * Network share problem is gone! Java now not working properly. Great. Some other misc. issues with the system. I ultimately decided to revert to a fresh Windows install (from a backup of a working machine). Partly because of this secpod/system restore issues and also because I have wanted a fresh start for a while. TL;DR: Steer clear of SecPod. It was a PAIN in the neck to get it installed. Made changes that I could not see again after they were done. No backup/restore option for the changes it makes. Licensing issues. Had to do a system restore. Thanks for sharing your experience with the program. At least some of the issues that you ran into could have been avoided by not requiring users to register an account first. 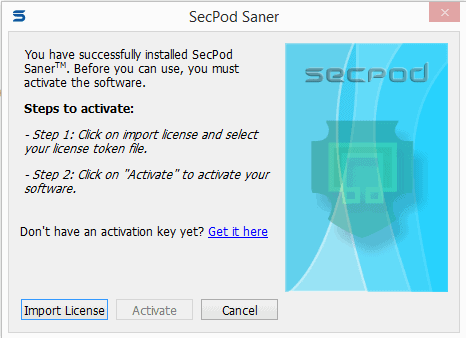 Now E-mail registration is not required to install SecPod Saner and most of the things were improved in the Latest version.